HP is about to rejuvenate its premium series of laptops named Spectre. Last day HP launched a new model of notebook to the Spectre series which the company claims to be the thinnest laptop launched ever. With a thickness of just 0.41 inches, the new Spectre laptop is almost 0.01 inches less than Apple MacBook. Inorder to make it HP made some mind-blowing changes to the usual design of Spectre series. Let’s go through the specifics of new Spectre from HP. The new Spectre laptop is just 0.41 inches thick making it the thinnest laptop launched till date. Even though it is the thinnest, new Spectre is not the lightest. It weighs nearly 2.45 pounds which is lot more when compared to Apple MacBook with 2.03 pounds, Samsung Notebook 9 with 1.9 pounds and LG Gram 15 with 2.2 pounds. The ports are packed to the back of the laptop. The laptop is having a recessed piston hinges which helps in making the laptop sleeker but holds the display properly at any angle. The new Spectre laptop’s bottom part is covered by Carbon Fiber. It is encased in CNC machined Aluminium chassis with Copper. The laptop also has a keyboard with is backlitted. For extensive audio Spectre laptops have speakers to the side of keyboard enhanced with Bang & Olufsend Sound. The new Spectre from HP is packed with a 13.3 inched screen. This display is having a resolution of 1920*1080 pixels. The designers set the resolution to 1920*1080 pixels inorder to conserve the power consumption. The display is enhanced with features like 300-nit brightness, IPS display along with 72% colour gamut. The display is composed of 0.4mm Gorilla Glass 4. The new Spectre from HP is powered by Core i5-6200U processors. The normal model is featured by a RAM of 8GB for flawless functioning. This model supports storage of 256GB of PCIe Solid State Storage. An alternate model of Spectre which is costlier will be loaded with Intel Core i7-6500U chip along with storage of 512GB SSD. Users may be disappointed to know that they won’t be allowed to enhance either memory or storage. This is because when HP tried to make Spectre the thinnest, it made the chassis difficult to open. 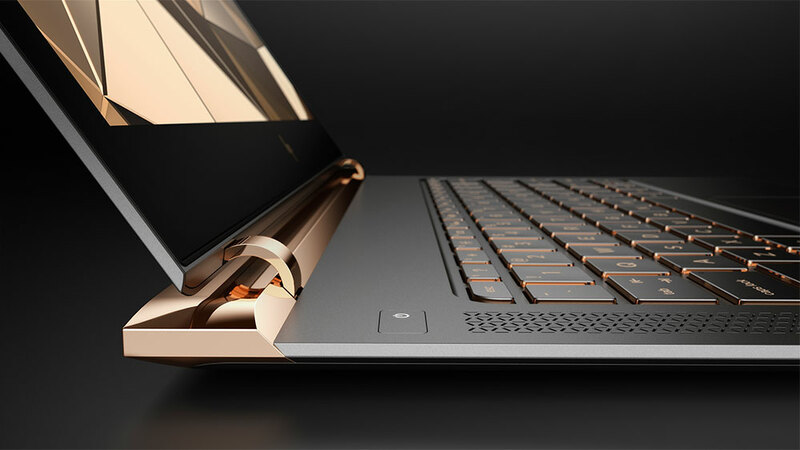 Users may be keen to know how HP made its new Spectre the thinnest laptop. Here I quoted the design changes made by HP inorder to make new Spectre thinnest. Cooling System: There are no fans or heat sink above the CPU. The fans are placed to the back side of the laptop. There are two fans – one for supplying air into the laptop and blows it over the CPU. Then this air is accumulated at the hyperbaric chamber, from where it is being sucked out with the help of the other fan. Display Unit: The display unit is just 2mm thickness. This became possible only because of 0.4mm Gorilla Glass 4 along with CNC machined Aluminium. Power Unit: The battery cells are spread under the keyboard and it prevented the requirement of separate space for placing battery. Keyboard: The keyboard unit is just 1.3mm thick. Even though the thickness reduced, the company doesn’t compromise with the accuracy and performance of the keyboard. Hinges: The recessed piston hinges allows the users to open and close the laptop with much ease. Even though it is designed to cut down the height of laptop, it still able to hold the display on any angle. A four celled 38 Whr battery holds the laptop live throughout the day. The officials claim that this battery can hold the laptop upto 9.5 hours. The new Spectre laptop has 3 USB ports of Type-C, which is placed to its back. This means that you can power up the laptop by connecting the power source to any of these USB ports. Users are also allowed to connect Display Adapter to any of these ports also. Of the three ports, 2 supports Thunderbolt 3 which helps in high speed data transferring from and to the laptop. HP officials made it clear that new Spectre laptops will be available for pre-order from 25th April. It will be available in Best Buy stores from May 22nd onwards. The normal laptop with Core i5 processor and 256GB storage is tagged at $1170. Another variant powered by Core i7 processor and 512GB storage is priced at $1250.